On Tuesday, March 26, representatives from Heritage Valley Health System, Variety the Children’s Charity and Highmark Blue Cross Blue Shield hosted the “My Bike” – Beaver County Kickoff event to launch an identification and awareness campaign in order to find local children with disabilities who are eligible for Variety’s “My Bike” Program. Also in attendance at the kickoff was Pennsylvania State Representative Jim Christiana. The “My Bike” Program, which was launched in November, was created to provide adaptive bikes to children with disabilities, so they too can enjoy the freedom of riding a bike. With 65 adaptive bikes sponsored and ready to be distributed to eligible children with a disability, the Beaver County community came together to form a partnership to identify eligible children for the “My Bike” Program. “Heritage Valley Health System is pleased to partner with Variety, Highmark, and the greater Beaver County community to identify eligible children for the “My Bike” Program. I hope this partnership, and ultimately the bicycles distributed through the program, can create a sense of community for those children living with disabilities and their families,” said Norm Mitry, President and CEO, Heritage Valley Health System. Every adaptive bike distributed through the “My Bike” Program is customized for each individual child and it can improve the riders’ social and physical well-being. As the founding and premier sponsor of the “My Bike” Program, Highmark has provided an initial grant of $55,000 in support of the program. “It’s our hope that the “My Bike” Program and the new adaptive bikes will help to not only serve as a positive model for surrounding communities to follow, but also as a catalyst of independence for children living with a disability,” said Deborah Rice-Johnson, Division President of Health Services at Highmark, and President of the Variety Board of Directors. In addition to the kickoff of the “My Bike” Program in Beaver County, similar events have happened in the other counties served by Variety to identify and serve as many children with disabilities as possible. Since the program began in November 2012, more than 180 adaptive bikes have been distributed or committed, and 245 adaptive bikes have been sponsored by generous individuals and companies throughout Variety’s 10-county service area, which includes: Allegheny, Armstrong, Beaver, Butler, Greene, Fayette, Indiana, Lawrence, Washington and Westmoreland counties. 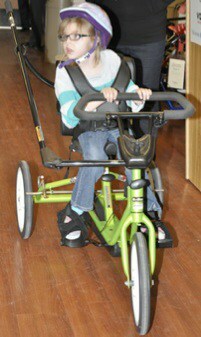 The cost to sponsor an adaptive bike through the “My Bike” Program is $1,800. Donations can be designated by county. For more information on Variety and the “My Bike” Program, please call 412-747-2680. The “My Bike” Program is an initiative to provide children with disabilities with adaptive bicycles so they may have the freedom of a bike and the joy of riding alongside friends. Variety the Children’s Charity is proud to be the founding tent (chapter) for Variety International, which has grown to a network of over 50 tents (chapters) worldwide. To learn more visit www.varietypittsburgh.org.